A few decades ago I was talking to a musician friend who had just come back from a trip to Ireland. He’d gone there, he said, to learn more about traditional Irish music. However, once he got there he realized that the Irish musicians he met weren’t all that into Irish music. Instead, my friend said, they far more interested in learning from him about the music of Hank Williams, Johnny Cash, and Merle Haggard. Indeed, lots of Europeans eat up American country and folk music. And lots of those people actually make such music, often with interesting results. Here’s a look at some recent European alternative country CDs I’ve acquired. * The Dad Horse Experience XXL Live In Melbourne. 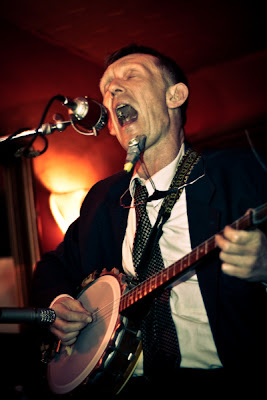 Dad Horse Ottn — don’t ask me where the name “Dad Horse” comes from — is a German banjo picker who bills himself as a gospel singer. “Keller-Gospel” is what he calls his brand of music, “keller” being the German word for basement. And indeed, while he doesn’t come on like some pious evangelist, and he’s not above using a little profanity when needed, Dad Horse’s songs deal with religious and spiritual struggles. In this respect, he reminds me of the Colorado band Slim Cessna’s Auto Club. Though most of his songs about sin and salvation sound serious, Dad Horse has a wicked sense of humor. The best example of this is the song “Lord Must Fix My Soul,” in which the singer confesses to his past sins. Unfortunately, in this live setting, Ottn interrupts the flow of the song too often with his stage patter. It’s worth seeking out the studio version on the 2008 album Too Close to Heaven. The album ends with the only real rocker on it, “I’m Not Here Anymore,” which gives the XXL part of the act a chance to earn their keep. The lyrics here aren’t especially spiritual, but your soul will feel uplifted. * Salty Pajamas. This self-titled album boasts some country-flavored craziness from Germany, which, like the Dad Horse CD, was sent to me by the German company Off Label Records (a dynamic little outfit that is also responsible for albums by DM Bob & The Deficits and the Brazilian one-man band O Lendário Chucrobillyman). This is a trio, featuring guitar, banjo, and drums, plus other various instruments as needed. Singer Jonas Hauter sings through an old CB radio microphone. 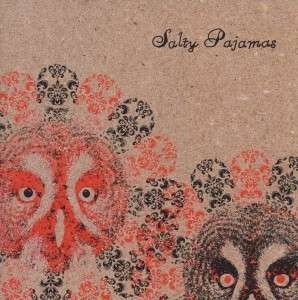 The Pajamas show a garage-rock influence on guitar-centric songs like “Spell,” “Wooden Friendship, ” and “Alliene,” which might make the ears of Yardbirds fans perk up. 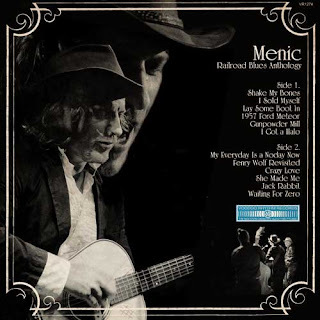 * Railroad Blues Anthology by Menic. O.K. , I’m cheating here, a little. The man called Menic lives in Switzerland. He’s played fiddle for Zeno Tornado & The Boney Google Brothers, and this album is released by the Swiss Voodoo Rhythm label. But he’s actually from near Boston. So technically, it’s not 100-percent European. The first thing that struck me about this record is how tame it is compared with other Voodoo Rhythm products. There’s far less screaming, slop, tomfoolery, and twistedness than you’ll find on most albums from the label, which has the motto “Records to Ruin Any Party.” In fact, songs here sound a lot closer to those of James Taylor than to the music of Zeno Tornado or Reverend Beat-Man. Don’t get me wrong. There’s plenty of good stuff here. Stripped-down, stomping folk-blues numbers like “Shake My Bones” and “She Made Me” are tasty, and the banjo-driven “Jack Rabbit” is lightweight but sticks to your ears. Best of all is the rockabilly-infused “1957 Ford Meteor.” Actually, I wish the whole album sounded like this one.